• Arrears of salary received by an employee are taxed in the year of receipt if the samewere not taxed earlier on due basis. Under section 89, read with Rule 21A(2), an employee can claim relief in respect of arrears of salary. Step 1: Calculate total tax liability (including surcharge and cess, if any) on the total income, including the additional salary of the previous year in which such salary is received. Step 2: Calculate total tax liability (including surcharge and cess, if any) on the total income, excluding the additional salary of the previous year in which such salary is received. Step 3: Find the difference between tax computed at (1) and (2) above. Step 5: Calculate total tax liability (including surcharge and cess, if any) on the total income, excluding the additional salary of the previous year(s) to which such salary relates to. Step 6: Find the difference between tax computed at (4) and (5) above. Relief undersection 89 is the excess of tax computed at Step 3 over tax computed at Step 6. No relief is available, if tax computed at Step 3 is less than tax computed at Step 6. 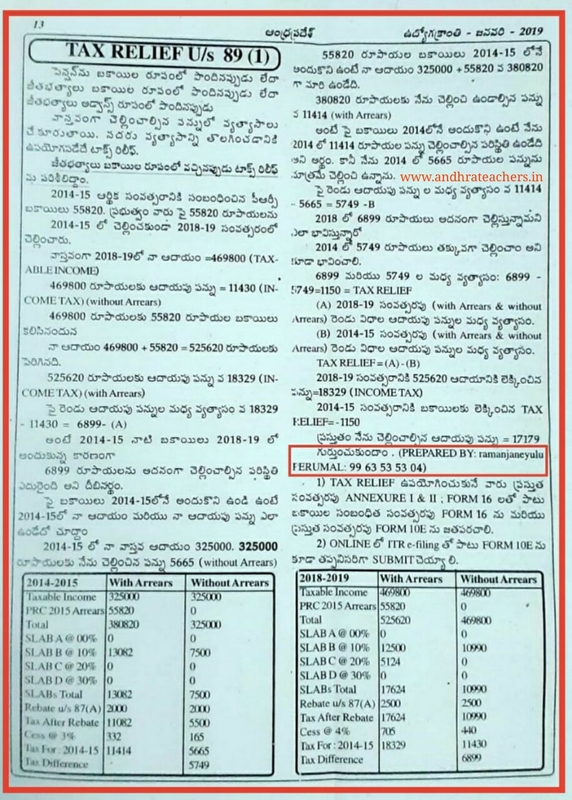 If the additional salary pertains to more than one previous year, then relief shall be computed in above manner by spreading such salary over the previous years to which such salary pertains to.